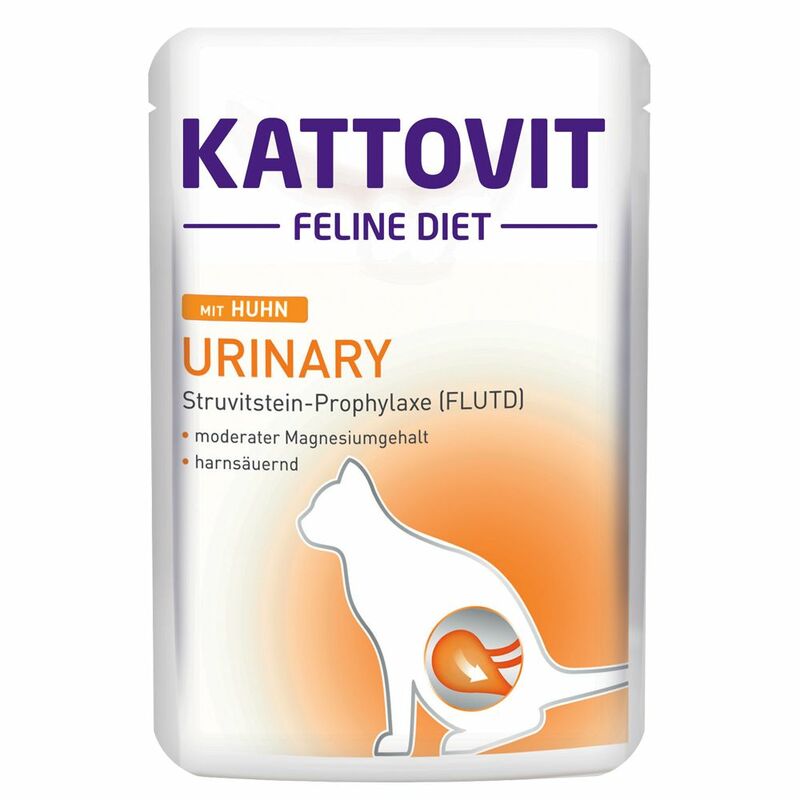 Kattovit Urinary Pouches have been specially developed to meet the needs of cats prone to diseases of the lower urinary tract. FLUTD (feline lower urinary tract disease) is a common disease that is often aΒociated with the formation of extremely unpleasant struvite stones, which in turn can lead to secondary diseases of the kidney. The reduced magnesium content in this food can reduce the level of magnesium in your cat's urine, helping to prevent the formation of kidney stones. At the same time, the added DL-methionine and calcium sulphate work together to increase the acidity of your cat's urine, maintaining a slightly acidic pH value of 6.4. This also aids in the prevention of kidney stones since they only are able to form in an alkaline environment. Taurine and other important vitamins and minerals round off this special diet, providing your cat with everything it needs to stay fit and healthy. Kattovit Urinary Pouches at a glance: Special wet food for cats prone to diseases of the lower urinary tract (FLUTD) Perfect for the prevention of struvite stones Low magnesium content: prevents the formation of new struvite stones containing magnesium With DL-methionine and calcium sulphate: acidifying effect, reduces the pH level of cat urine With taurine: eΒential fatty acids for a healthy heart and good vision Important vitamins and minerals: for a complete, well-balanced diet.